Did you know that “Experience” has been identified as the fourth economic offering? Commodities, Goods, Services and EXPERIENCES – Harvard Business Review. And, this “Experience Economy” has powered the events industry over the past decade. As event organisers, this shouldn’t surprise us. After all, we are in the business of creating experiences for our attendees. The experience is what will have attendees talking, posting and sharing with others at the event and days, months and sometimes years that follow. 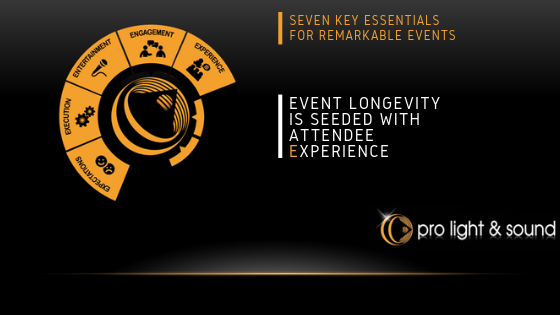 The more impactful, fun, engaging, different, imaginative and even bewildering the experience the more longevity that event experience and impact will have post-event. Experience is only limited by imagination. Although any experience is better than a boring “stock standard” event, an experience that is aligned with your organisation’s values and vision or event purpose is key to even greater success. Think about the organisation, the event purpose and that type of audience/attendees expected to attend. If this is an internal organisation event look for team building experiences. If this is a fundraising activity look for experiences that will encourage more donations. If you are launching a new product, think of how you can use technology to enhance the experience. And, if this is an event for a younger demographic find a way to get them out of their seats and moving. Experience is the spice of life so make sure your event really leaves a tang! At Pro Light & Sound we have been helping our clients create great experiences for their client for their clients since 1989! We know how to wow, we know what will work and what will detract from the event. If you are looking for an event partner to help you create the best experience, look no further than Pro Light & Sound.